George Orwell wrote in Nineteen Eighty Four that ‘If there is hope, it lies in the proles.’ A century earlier Marx was unequivocal: the future belonged to the proletariat. Today such confidence might seem misplaced. The proletariat has not yet fulfilled Marx’s expectations, and seems unlikely ever to do so. How could Marx have entertained the notion that the proletariat would emancipate humanity from capitalism and from class rule itself? 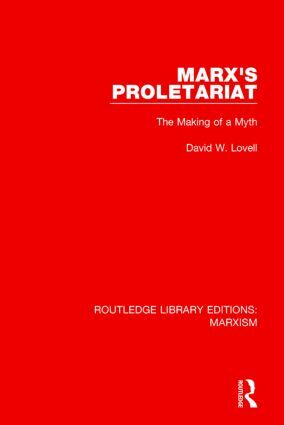 This book, first published in 1988, attempts an explanation by examining the sources and development of Marx’s concept of the proletariat. It contends that this was not only a crucial element in Marx’s theory but a significant departure in socialist thought. By examining this concept in detail the book uncovers a major contradiction in Marxian thought: although the proletariat is assigned a momentous task it is chiefly depicted as the class of suffering which is why, historically, it has preferred security to enterprise.